Pool fences are a must for every pool. In the state of Victoria, if your pool was built after 2010, then you are legally required to have it surrounded by a safety barrier (fence) – with a minimum height of 1.2 metres. But just because a pool fence is a necessity, doesn’t mean that you need to rush into a choosing a pool fence as soon as your pool is built. It’s a big decision to make. Let’s remember that at its core, having a pool is a lifestyle decision. You want your pool to fit your lifestyle, and often, it’s very specifically designed to look exactly like you want it to. A pool is a big expense and investment – but we usually just consider pool fencing as an afterthought; an ugly essential that needs to be there to conform to state laws and regulations. Getting a pool fence is just as big a decision as deciding on the look of your pool. It’s not a choice to be made lightly, because it will likely surround your pool for years to come. That’s why, in those situations, it’s important to consider pool fencing. 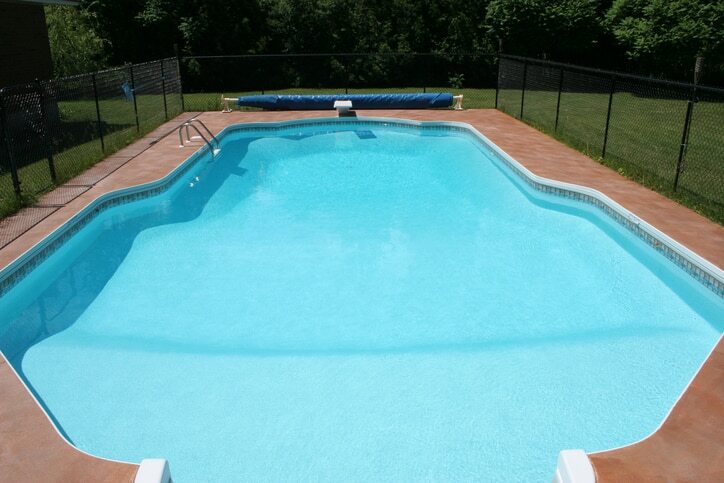 Why Opt For Temporary Pool Fencing? So, what is temporary pool fencing, and when is it important? Temporary pool fencing should only be used during construction. If your pool is filled with more than 30cm of water, it is deemed to be a functioning pool and, as such, must have a fence or safety barrier around it. A temporary pool fence can only be used short-term; a permanent fence or barrier must be erected. A temporary fence around a swimming pool fence must be constructed from durable, weather-resistant material, such as metal mesh, held up with metal poles that are capable of withstanding dynamic forces, such as a storm or heavy wind. For further information on temporary pool fencing requirements, visit the Victorian Building Authority. At Everlast Services, we have a whole host of swimming pool fences for you to choose from. You could opt for aluminium fencing, which you’ll never have to paint and which is waterproof; or you could go for one of our sleek glass fence options. We even offer galvanised pool fencing. The only issue is, there’s no real way of knowing how your pool will look with a fence, until it’s surrounded by temporary fencing. We’ll be able to get your temporary pool safety fence up and running, to immediately protect your children or any family members who can’t swim, while you can inspect samples of our permanent pool fencing options. All this is in the interest on giving you the best, and safest fencing long-term. At Everlast Services, we have over 20 years of experience across a variety of fencing, and we don’t compromise on quality.